Many people think about it before that there should be an application or tweak which allow them to share the things to other iOS devices using AirPlay like they are doing on Apple TV, well there is a tweak launched in Cydia with name of “AirServer” which let you to share media with other iOS devices while using the AirPlay function of Apple. 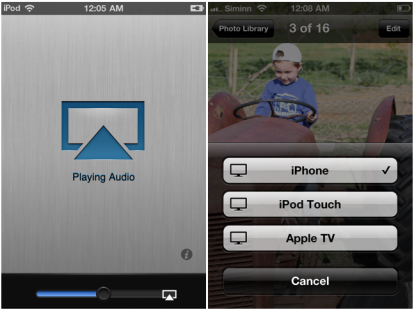 In other words, now you can share music, videos, and images via AirPlay from your iPhone to any iOS device like iPad. The developer has released the demo video as well to explain the actual work of the “AirServer”. To share your media with other iOS device using AirPlay functionality with “AirServer”, all you need to do is download the application in the receiver device and launched the app on the device, suppose if you want to share video playback from your iPhone to iPad, you just have to download the app on iPad and run it. Now simply heads to your iPhone and play video and select the AirPlay option and check the iPad, that’s it, your video content will be start displaying on the iPad. Obviously, to work, AirServer requires that all devices are connected to the same WiFi network. AirServer found in Cydia and you can buy from the BigBoss repository at a price of $ 4.99. Recommended secure shopping!